This 90° nut will work on the 1.5" heavy duty and 1.5" light duty bulkhead fittings (aka tank adapters). Instead of coming straight out from the fitting, this nut forms a 90° bend. 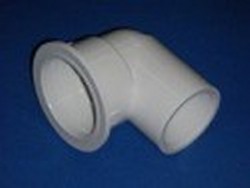 Will only fit 400-9150 & 92015 bulk head fittings only.